The lake area real estate market has seen continuing recovery over the past year and 2014 brought a modest increase in home sales and values. The latest updates from industry reports show positive indicators on a national front that I feel apply locally as well. As I reported last month, the new home market is finally improving, as demonstrated by single-family housing starts­—the number of privately owned housing units on which construction has begun. Single-family starts in October were at the second-highest level in more than six years. Homebuilders are encouraged by this increase in activity, as builder confidence also improved this month. The National Association of Home Builder’s Housing Market Index reached its second-highest level since November 2005, which was before the housing downturn began. The index reading is now at 58, which is 7% higher than last year. October broke the 11-month streak of year-over-year declines in total home sales. In October, we reached an annualized rate of 5.26 million sales, which was 2.5% higher than last year. The pace of existing home sales has increased in six of the seven previous months. The quality of sales is improving, with a substantial drop in the volume of distressed sales. If you look solely at good old-fashioned, non-distressed sales, October was up 2.6% over September and 8.2% over last year. It’s beginning to look a lot like a recovery. Tight supply remains a factor holding back the potential volume of home sales. The inventory of existing homes for sale fell 2.6% to 2.22 million homes, or 5.1 months of supply at the current pace of sales. And while the pace of single-family construction is finally growing again, the growth is not enough to keep up with increasing demand. Sales Activity has increased over the Summer season after a lull in the Spring market. Many reports have attributed it to the severe weather we experienced. Based on the fact that I worked successfully with several clients during the worst of the weather and that the downtrend was nationwide regardless of location, I have a hard time blaming it on climate conditions. I personally feel many buyers and sellers were hesitant to move forward due to the unrest felt in the country and unknown future outcome of various legislation. Whether your opinions are pro or con on the laws enacted, it has affected our marketplace. Total sales this year stand at 1559. This is slightly below last year at this time, 2013 total sales were 1592. However it is a healthy increase of 36.3% over 5 years ago in 2010. Commercial movement is increasing. Some current construction includes the new hotel and conference center at Old Kinderhook and excavation is in process at Eagles Landing in Lake Ozark. There is much speculation about what new business will be located there. 42 commercial sales have closed so far this year with an additional 17 properties under contract. This is huge increase of 162.5% over 2010. Residential building permits in Camden County have steadily climbed from 15 in 2011 to 32 this year. Information is based on reports from Camden County with data available from January 1, 2011 thru July 22, 2013. Sales data was obtained from the Bagnell Dam and Lake of the Ozarks Board of Realtors MLS from January 1, 2010 through August 25, 2013. If your property is not for sale or is not located in an area that requires an electrical inspection for the transfer of the permit, I highly recommend that you still contact the appropriate agency for an inspection. Most of the districts charge a $50 fee for the inspection. In my opinion this is a bargain, especially if you consider the potential cost of having an electrical issue on or around your dock. This month I’m going to review a breakdown of the property sales so far this year. This will include property types as well as location. Obviously within any given property type there are still a lot of variables so if you have questions on how a specific property fits in the whole scheme of things as far as what is selling, please contact me with the details. Through June 15, 2014 there have been 934 properties sold via the Bagnell Dam/Lake of the Ozarks MLS system. 62.8% Homes, 22.6% Condos, 11.1% Lots/Vacant Land, 13.3% Commercial,. As you can see, 85.5% of sales were residential dwellings. The home sales breakdown is as follows: 43.1% lakefront homes, 13.4% lakeview and/or lakeaccess homes, 39.8% offwater homes and 3.5% Villas. Lots & Vacant Land Sales: 25% lakefront lots, 15.3% lakeview and/or lakeaccess, 59.6% offwater lots. In reviewing the offwater lot sales; the majority of these were acreages ranging from 5-80 acres but sales also included small building lots, 14.5% were golf course lots and one larger tract with 205 acres sold at $229,250 and had a couple of cabins, ponds and was a hunting retreat. Condo sales were concentrated in the Lake Ozark (includes Horseshoe Bend/Four Seasons and some Northshore), Osage Beach and Camdenton areas totaled 89.5% of the market. With Lake Ozark and Osage Beach each accounting for 33.1% of total condo sales and Camdenton with 23.2% of sales. In general, I saw a slow down in activity in May and the beginning of June. The middle of June, I am seeing more activity primarily in the lower price condo range. Sellers and buyers are beginning to come together better in negotiations. Some are still on opposite poles with sellers holding out based on prior values and buyers are still looking at the decrease in the market and trying to make a deal. In general, I see more educated buyers and sellers in regards to the market values and I feel that I and my fellow Realtors are doing a good job of taking the time to help them see the true picture. 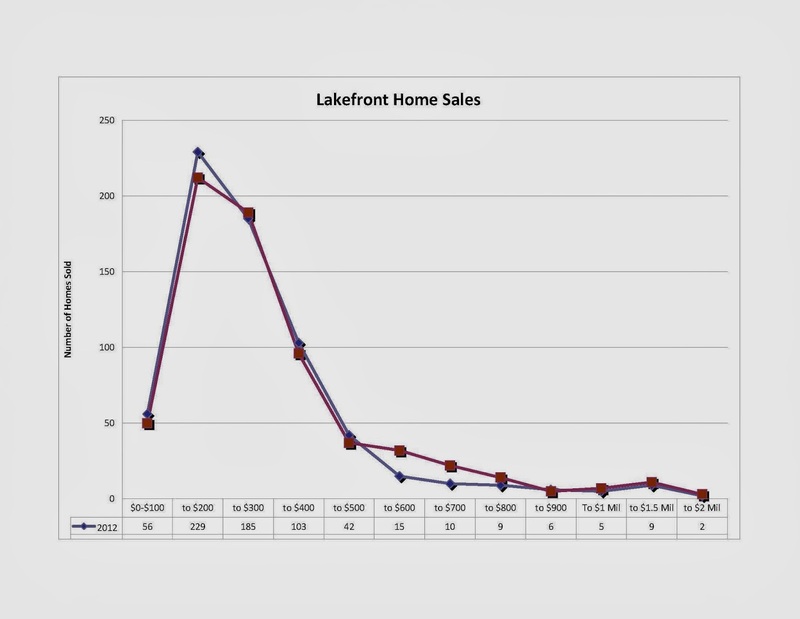 This month I have compiled the data on lakefront home and condo sales for a 10 year overview of the market. The chart represents sales in 2005 thru 2014 comparing January 1 thru May 15 of each year and was obtained from the Lake of the Ozarks/Bagnell Dam AOR MLS. As you look at the average sales prices, you can follow the rising values up to the 2008-09 time frame. In 2009-2010 values began to fall then bumped up and down through today. I cringe to say this, but based on what I see from working daily in this market as well as looking at the sales data, many properties are realistically worth what they were in 2005. 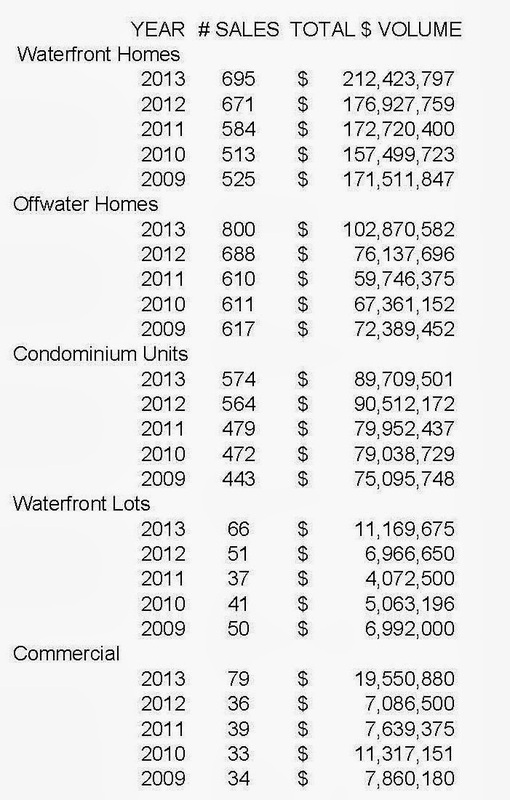 Total condo sales rose again in 2013, up 9% over 2012. The 2013 numbers represent an increase of 29.6% over the low points that occurred in both 2009 and 2011. 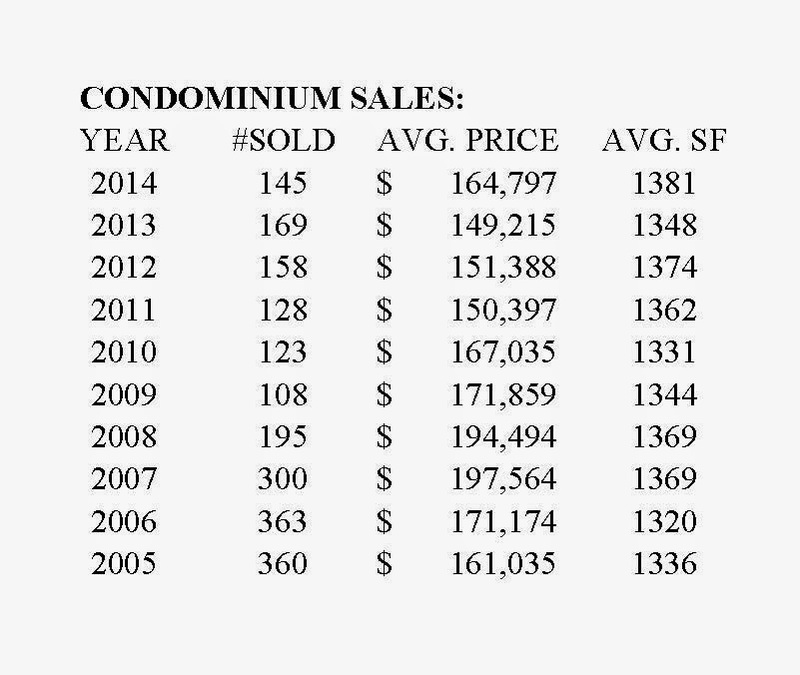 Below is a chart detailing the condo units sold each year in varying price points. 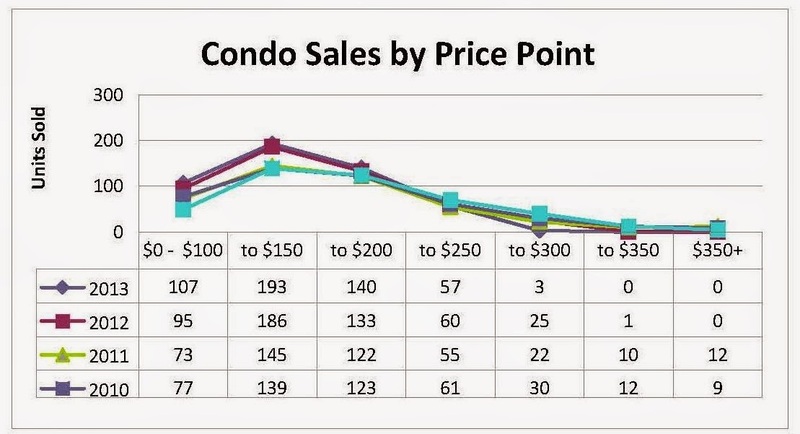 As we saw in the upper end home market, the upper condo range has flattened out with sales over $300,000 being almost non-existent the past 12 months. There are currently a total of 735 units actively on the market. In addition, there are currently 55 units under contract. All data is from the Lake of the Ozarks Multiple Listing Service for the dates and years shown. My office will be hosting the May Business Journal Social at Bootlegger’s on Thursday, May 8th, stop by to visit and kick off another great season at Lake of the Ozarks. 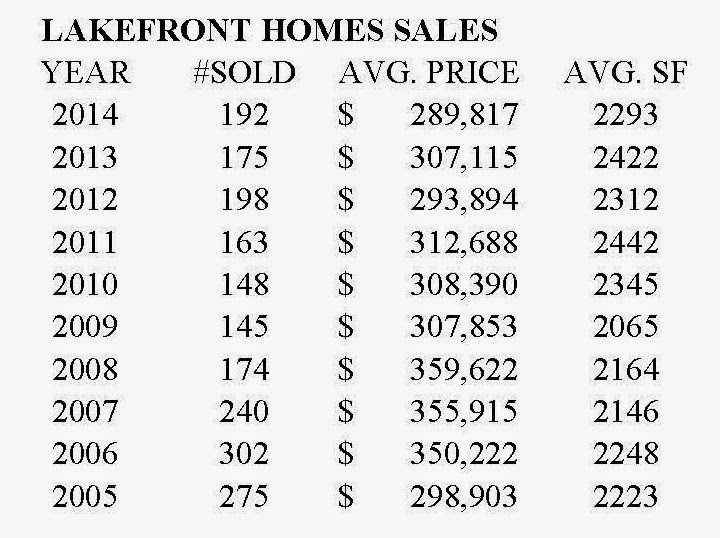 Below is a comparison of lakefront home sales in 2012 and 2013 at Lake of the Ozarks. 2013 saw a small increase in the number of homes sold with 7 more sales than in 2012. The market saw a slight shift in number of homes sold in the various price ranges with the $500,001 to $800,000 price points seeing the largest gains. The $100,001 to $200,000 range was still the largest part of the market making for 31.2% of sales however this was a decrease from its share of 34.1% of the market in 2012. The luxury home market also showed very modest improvement, the increases are not large; however this is a small part of our overall market. I feel the decrease of sales in the lower price range is mainly a result of a reduction of inventory due both to sales and rising home values. (You cannot purchase the same home for $200,000 as you were able to just 2 years ago.) As I’ve reported in the past, the luxury home market took one of the biggest hits in terms of both number of sales and values. It is promising to see a return in confidence of buyers in this market. I do feel the sales in this range have been driven by price adjustments. I feel this market will rebound more slowly in part due to the fact that many of the luxury home sellers are able and willing to wait for market values to increase rather than reduce their prices. The increase in the mid to upper range is very exciting as this represents a portion of the market where pent up demand is being seen as a surge of buyers who have held off on purchases due to the uncertain economic climate are moving forward. Last month’s article did not make the February Business Journal issue due to an error on my part. I apologize to any readers who missed this. I reported on the sales activity over the past five years broken down by property type. This report showed a steady increase in sales with 2013 showing increases in all property types. If you didn’t receive a copy of the report from me via email or read it on my blog, you can access it at www.AsTheLakeChurns.com or send me an email and I’ll get it right to you. Sales info: Lake of the Ozarks MLS for all times reported. If you would like a detailed sales report and value for your specific property type or neighborhood, or would like information on the best buys at the lake, contact C. Michael Elliott & Associates at 573.365.SOLD or cme@yourlake.com. Below is a report of sales activity at Lake of the Ozarks over the past five years and include sales from 2010 through 2013. As you can see, the sales have been steadily increasing with 2013 showing increases in all property types. Data is based on information from the Bagnell Dam Association and Lake of the Ozarks Board of Realtors MLS for all times reported as of January 14, 2013.